06:6-41 (4/7/2008) – Positive for withering syndrome and phage; used in the MiSeq run by Stan Langevin. 06:6-53 (4/9/2008) – Positive for withering syndrome and phage; used in the MiSeq run by Stan Langevin. 08:4-1 – Positive for withering syndrome only – no phage. UW08:22-11A – Pinto abalone naive for both withering syndrome and phage. All samples were run in duplicate. See qPCR Report (see Results) for plate layout, cycling params etc. Great news! No amplification in the 08:4-1 (positive for WS, but naive for phage)!! 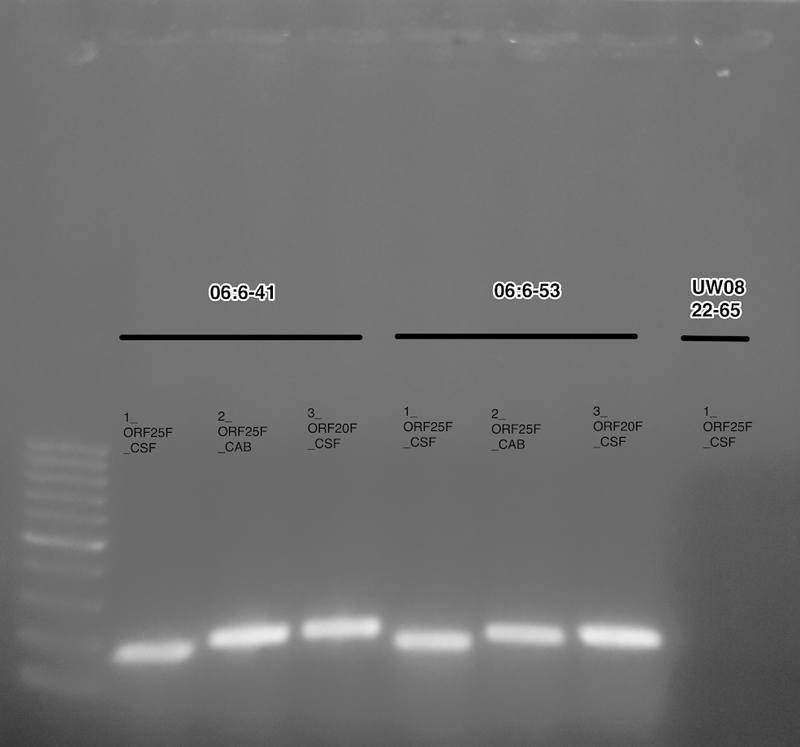 These results strongly suggest that these primers are specific for the WS bacteriophage! This is really cool and exciting. Next steps will be to confirm via in-situ hybridization (ISH). Primer set ORF25_CSF shows the highest sensitivity. This entry was posted in Abalone Withering Syndrome Phage ID and tagged 06:6-41, 06:6-53, 08:4-1, 1_ORF25F_225_CSF, 1_ORF25R_399_CSF, 2x Sso Fast Eva Green Master Mix, 2_ORF25R_320_CAB, 2_ORF25_121_CAB, 3_ORF20F_121_CSF, 3_ORF20R_326_CSF, abalone, black abalone, Dg, digestive gland, DNA, Haliotis cracherodii, Haliotis kamtschatkana, phage, pinto abalone, qPCR, Stan Langevin, UW08:22-11A, withering syndrome on 20 August, 2014 by kubu4. Ran samples on 1.2% 1x TBE + EtBr. Good amplification from all three primer sets. The pinto abalone sample (UW08:22-65) that should be naive for withering syndrome and phage did not amplify as expected. Excised bands from each primer set in the 06:6-41 group and purified using Ultrafree DA spin columns (Millipore). Will save for potential cloning usage, depending on future results. This entry was posted in Abalone Withering Syndrome Phage ID, In-situ Hybridization and tagged 06:6-41, 06:6-53, 1_ORF25F_225_CSF, 1_ORF25R_399_CSF, 2_ORF25R_320_CAB, 2_ORF25_121_CAB, 3_ORF20F_121_CSF, 3_ORF20R_326_CSF, abalone, Apex Red, gel, gel extraction, in-situ hybridization, ISH, MiSeq, O'GeneRuler 100bp DNA ladder, PCR, phage, Stan Langevin, Ultrafree-DA, UW08:22-65, withering syndrome on 13 August, 2014 by kubu4.